YOU’RE SUCH AN ESTABLISHED HAIR STYLIST – BUT YOU SEEM TO DO IT ALL ON YOUR OWN TERMS. HOW DID YOU GET STARTED? I was naturally just really good at styling hair, so when I was a teenager, I used to do a lot of weddings, hairstyles and blow-dries, but my mum said to get an education just in case – you never know what the future brings. So I went to a really great academy to get my qualifications and it went from there. By the time I passed my exams, I had a waiting list of people wanting me to do their hair! So I think it was just meant to be. WOULD YOU RECOMMEND BRANCHING OUT ON YOUR OWN STRAIGHT AWAY? I think with hairdressing you can’t just go into it all on your own. It is important that you work in salons to develop good customer service and to get a good idea of working hours, because the hours are so long. You learn how to handle situations and learn from others who are above you. I worked in salons up until I was 22 – and I worked on a cruise ship because I wanted to be able to know how to do different types of hair, not just western hair. That gave me the ability to handle stressful situations. If you go off by yourself immediately, then you’ve got no one around to guide you on how to handle things like that. WHAT DID YOU LEARN FROM THE CRUISE SHIP, SPECIFICALLY? Well, that’s where I get my speed from, because people from cruise ships want to have fun – they don’t want to spend hours in a salon, so you’re always under pressure to deliver a beautiful hair-up in thirty minutes. And I learnt how to communicate with different types of people and get to know different cultures which, in hairdressing, is very important. You need to be a people person because whoever sits on your chair – and wherever you are in the world – its nice to be interested in them and know a bit about their life and culture. YOU TRAVEL SO MUCH – HOW WOULD YOU SAY WOMEN’S ATTITUDES TO HAIR VARIES, COUNTRY-TO-COUNTRY? In the Middle East, women love to look after themselves and are completely into having beautiful hair which is what I love. Then you go to places like Australia, where they’re a bit more beachy… at the minute I think hairdressing is universal – everyone has this same, happy image of beautiful hair. That’s what’s really nice about hairdressing right now, that we’re all sharing visions of how hair should look, which is really good. At the minute, wherever I go in the world everyone wants to have beautiful, classy, natural looking hair. They’ve gone away from all those crazy styles. ARE PEOPLE USING DIFFERENT PRODUCTS IN DIFFERENT COUNTRIES? YOU’RE KNOWN AS THE ‘QUEEN OF BALAYAGE’ – ESPECIALLY IN THE MIDDLE EAST. HOW DID THAT HAPPEN? Basically my hair is very thick. When I was young and I had it done in a salon, they would put highlights in, which was big at the time – and I would look like I had stripes coming out of my brain! It used to make me very frustrated, it made my hair look much drier than it was. Because the striper the hair, the drier it will look. I always loved how Victoria’s Secret models look really effortless and I’ve got four nieces and all of them have all had the most beautiful haircolour where it changes around the base and the tip, so I was always saying that’s how I want my own hair. So I was just playing with my own hair and then this woman stopped me on the street asking where I got my hair done. And then I said I’d done it myself and gave her my business card. And it went from there. WHAT DO YOU THINK WILL BE THE NEXT BIG THING IN HAIR STYLING? 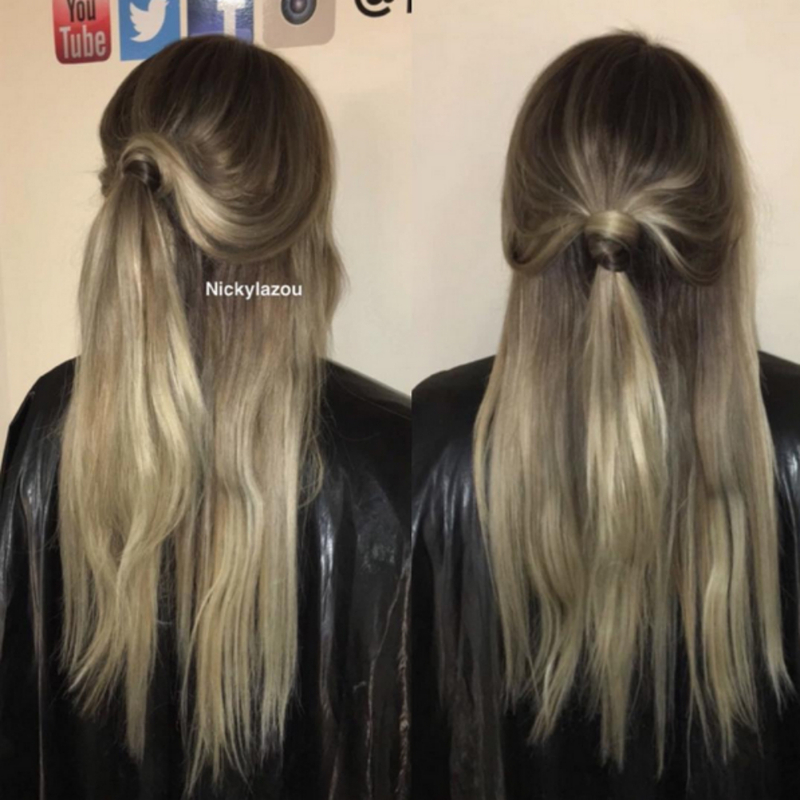 I don’t think balayage will ever go out of fashion. Balayage is how hair should look. It’s not a fashion that’s going to come and go – it will never go out of fashion. However, I do think that what’s going to happen in the future is that people will be more brave with experimenting with their hair, having more fun and being more adventurous, and taking care of their hair more, too. YOU HAVE OVER 35K FOLLOWERS ON INSTAGRAM, AND A YOUTUBE CHANNEL. HOW HAS SOCIAL MEDIA FURTHERED YOUR CAREER? I love my YouTube channel because I deal with so many clients every single day, and they don’t always know the importance of hair care, so my channel means I can show them a DIY – rather than throwing too much information at them when I see them. What’s magic about all of this is that I’ve always been very lucky in my career. Hairdressing should not be looked down on – if someone wants to do hairdressing, they definitely should, because it’s an incredible career. Social media means you’re showing yourself off to the world, and you shouldn’t be shy to show people what you can do – that’s amazing – but at the same time, it can also ruin a business. As long as you do honest work and as long as whatever you’re putting out their on social media is the truth, then you can definitely grow your brand. But what you need to focus on first is delivering great work, because social media is not always going to be there. I think people think that I’ve just come from nowhere but I have been doing this since I was 15, and it’s all I know. I sacrificed my social life for this career. People say to me there’s more to life than work but this is life for me. WHAT WOULD YOU SAY TO ANYBODY WHO WANTS TO BREAK OUT ON THEIR OWN? I would say you should never go off on your own unless you’re a hundred percent confident. Enjoy being in a salon environment because you can learn so much from different people and stylists and your managers. But if you feel like your ready, I definitely think you should take the courage and do it. Believe in yourself, because if you believe in it enough, someone else will see your vision as well. Then it’s like a snowball, more and more people will start to believe in your vision too. I don’t think you should compare yourself to anybody else. I’ve never invested in worrying about what my neighbours are doing, because it is all art. Don’t focus on your competition. I don’t like it when people are negative towards each other – we should all support each other. In every single career you have to invest in yourself.